With the recent announcement of their tour with Listener, we open the tour diary of one of Laundry Echo's very favourite bands, Treehouses, and take a look back on their last tour with Isla Ka. 2am and 5am flights out of Perth, staggered because it was cheaper. Fiz and Tim cop the rain on the tarmac, Fiz gets told off for taking photos. James and Ethan find the others asleep on the floor at gate 49. Tour officially begins. Four games of Animal, Vegetable, Mineral in the tour van (tuning peg, Myspace, taste buds, carribeana). Tim REALLY cares about rules: “rules make fun more fun”. Lots of cats at Sev and Josh’s place, cooked up a big pot of pasta, watched a bit of Queer Eye. Met tour buddies ISLA KA at the venue, answered all the trivia questions and loaded in. Boots Porter has insane vibrato. Keen as to see ISLA KA another four times. Able to watch World Cup while on stage – classic Hamo. It was a vibe, good start to the tour. Our gracious host Em takes us out for breakfast – everyone orders the same weird charcoal flat bread thing and filter coffee. Pretty good. Met up with a lovely new friend for an interview – we talk about where Treehouses started and how much has changed. We get really excited about future plans. Admin day – found a café with free Wi-Fi and just parked it, man. Tour buddies ISLA KA sorted out some flights, Ethan wrote the first part of the diary. Emails cleared. Drive up to Sydney – Tim finally has control of the aux chord and blasts some sick trap beats. We arrive at our accommodation in Enmore (staying with Fiz’s old uni friend Kate and her cat Gumnut). Showers for everyone. Upstairs shower has two shower heads – James tests out both. We load in to Brighton Up Bar and decide to go get food – Tim says that there’s a Lord of the Fries 10 minutes away. Takes us 25 minutes of fast walking. Lots of familiar faces and friends at the show – a really lovely night. The sound guy creates an endless loop of drink tokens for us. Big day. Early start to get to the airport – Ethan and James miss their flight as hordes of school children heading on a sports trip are prioritised in the oversized baggage line ahead of them. Courtney Barnett and Jen Cloher also waiting. Shannon Noll punching darts outside. Tim and Fiz have too much carry on and have to repack – Fiz: “My phone is in the bin. I think I threw my phone in the bin!” Airport staff waiting unhappily. Phone is in Fiz’s pocket. 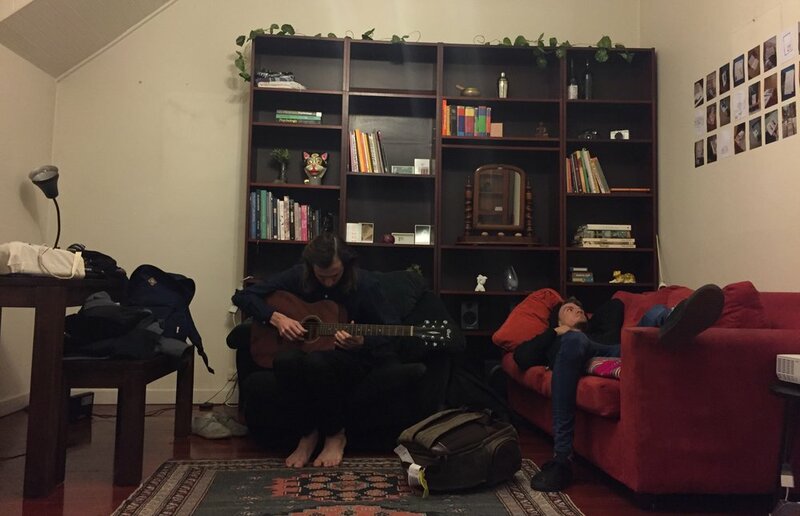 Everyone makes it to Melbourne, and we have a much needed four hour nap at Fiz’s place in Brunswick. Fraser makes homemade hummus. All of our gear and members in one very small car – we arrive at the Rev and get right into some vegan tacos. A Rioting Mind were sick, and the Flying So High O’s did a flawless cover of Radar Detector. Met a guy called Trent outside, then met him again after the show (he did not remember us). Lots of really sage life advice eg. youth is all about mentality/you’re only as old as you think you are. Fiz takes us for breakfast at Kines – Tim literally says that the vegan mushroom toastie is the best thing he’s ever eaten in his life. Unlimited filter coffee. We do a Savers trip – Tim gets a very suitable oversized cardigan. It’s decided that we’ll do a stripped back guitar and vocals set at the show – we all pile into a single uber with unhealthy sounding suspension, and feel car sick moments after the trip starts. Greeted by new friends out the front of the house, we head around the back and immediately decide that we should do a full band set. James and Fiz head back to get the rest of the gear. Quentin belts out his tunes in the backyard – we all have this powerful flashback to 2014/15 when Treehouses started – house shows with friends and beautifully honest music. The feeling doesn’t stop, all the bands kill it. Only two people walked into the glass door thinking it was open (hope you’re okay Frankie and that other guy). We dim the lights and convince the crowd to come as close as possible for our set – something clicks and we have the most fun we’ve had playing a show in a while. Jerome yells out ‘yeah!’ each time Ethan plays that country twang riff in ‘Well and Truly’. A beer is spilt on the floor moments before we start playing ‘You Spilt Beer on My Canvas’ – serendipitous. We end the set with a very raw rendition of a brand new, quite unfinished song – it feels great. Kines for breakfast again. Sianne from Extended Family drops by the house and we do a cosy session in Fiz’s kitchen. An old song and a brand new one – Ethan and Sianne try to figure out who came up with ‘Extended Family’ first (the title of our 2016 EP). Turns out it was Luca Brasi. Very Good Falafel for a late lunch – surprised to report that it was very good. We all split up to see various old friends, and reconvene for an afternoon nap. We cover the first minute of an ISLA KA song and send it to them – withdrawals hitting hard already. We get everything ready to go and then head into Brunswick for a mulled wine. We talk about what we achieved and what’s next – plans for recording, touring, and everything else. We’re all sitting on a bittersweet buzz, not ready to leave but stoked with everything that happened. Fraser drives us all to the airport, and we fly back to Perth.